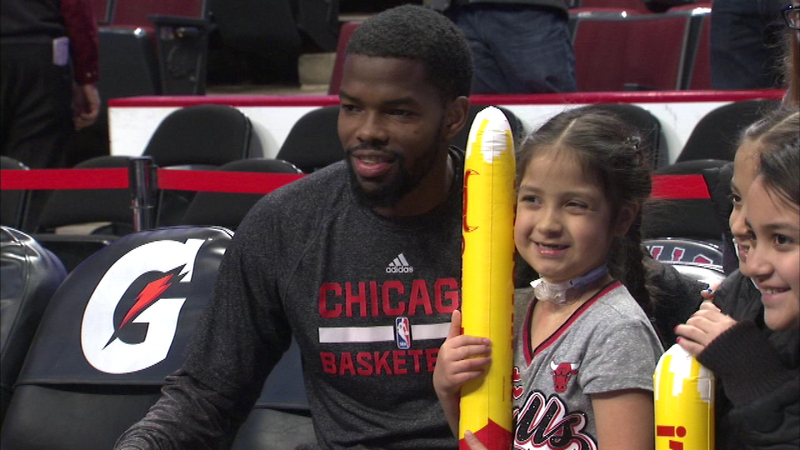 Bulls guard Aaron Brooks poses with 6-year-old Elena Perez before Monday night's game at the United Center. CHICAGO (WLS) -- A 6-year-old girl got to rub elbows with the Chicago Bulls before Monday night's game at the United Center. Elena Perez was born with only one lung and spent most of the first year of her life in the hospital. Monday night, the NBA team's "Embrace-a-Bull" program gave her the chance to get the courtside VIP treatment. Little Elena is a big fan but admits her favorite team member is Benny the Bull, the team's mascot.